Click on photo above for larger image. Memphis, TN - I extend a large thank you to Rainer Klauss, LHS '64, for allowing me to republish the article below that he wrote 10 years ago. He was also kind enough to delay posting on Facebook the images included so that I could have first rights, even though the Orange Bowl band trip has been a hot topic on Facebook. Once again I am using the first issue of the year to remind you of the classmates we lost over the last year. I know we will all miss them. I hope you all have a safe and Happy New Year. 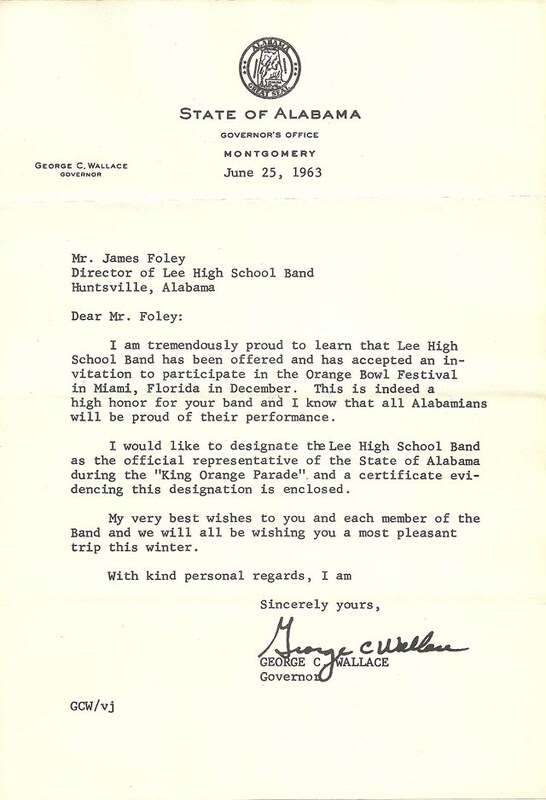 Forty years ago, in the early evening of Friday, January 3, 1964, the Lee High School Band rolled up in front of the school, having completed its duties as Alabama’s Official Representative at the Orange Bowl Festival in Miami. Greeted by the welcoming fanfare of our families, we proud but weary ambassadors swarmed out of the three buses, picked up our gear, said goodbye to our friends and lovers, and headed back home for de-briefings and familiar comforts. In our nine-day musical odyssey through three states, we had gotten an early thrill, strutted our stuff before a national television audience, enjoyed prime seats at a major bowl game, and, in general, had given a good account of ourselves while we experienced as much fun and pleasure as a healthy group of teenagers could (given that we were chaperoned). For those of you who were lucky enough to participate in the trip, I hope the following reminiscence sparks your memory and reminds you of the good times. For those of you who had to stay behind in the cold, here’s a condensed, expurgated version of what happened. I am fortunate that my mother saved the booklet that the Band Parents Association created for this trip. It’s the blueprint of a bold and ambitious venture. This seventeen-page document is, in its very comprehensiveness, an indicator of the many complexities and details a project of this nature had to address and resolve. Since the author or authors are anonymous, I don’t know who to praise for this manifold document. It’s an itinerary, history, organization chart, passenger manifest, code of conduct, vision statement, and public relations pamphlet all rolled into one. Much of what I relate here comes from its pages. The idea of pursuing a bid to participate in the Orange Bowl Parade was introduced at one of the committee meetings of the Band Parents Association in December 1962. Robert Becks, the father of Sylvia (’64) and Roger (’65), provided much of the vision, drive, and experience that helped make the dream come true. His co-chairman was C. M. O’Bryant, the father of Richard (’64). These two men were ably assisted by Mr. Foley, the band director, whose main responsibility was developing our musicianship. A lot of the essential work of organizing this expedition was done at another level: many of the smart, talented and dedicated parents of the band members stepped forward to make things happen through committees and individual initiative. Ultimately, of course, this project gained the assistance of the entire school and community. 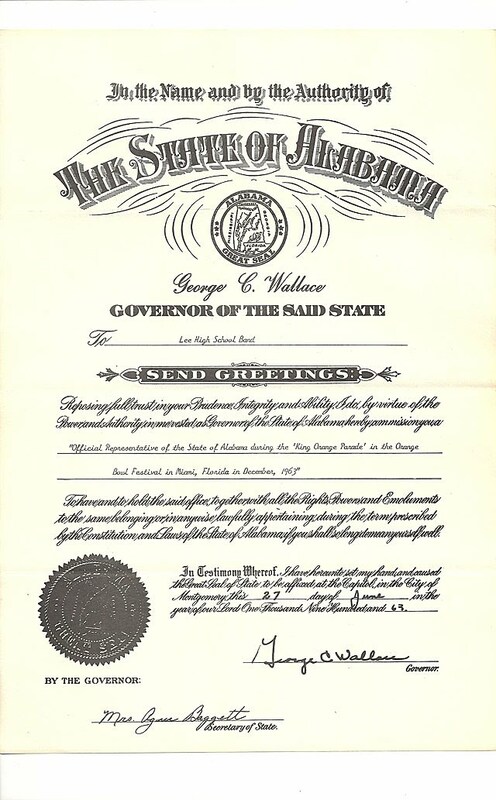 As an example of the city-wide influential support the Orange Bowl Committee (OBC) sought, the Honorary Executive Committee of the project included Mayor Searcy, Dr. Wernher von Braun (Director, MSFC), General H.P. Persons (Commander, Army Missile Command) and many other officials and business people in the city. The operative word in that sentence is “honorary,” of course, but even such gestures could be beneficial. “Think Big” must have been the motto of the OBC. They went all the way to the top and reached out for support from NASA (hoping to procure the services of Alan Shepard or John Glenn) and President Kennedy, but neither request bore fruit. To help pay for our fun in the sun, we engaged in numerous fund-raising efforts. Each band member was enjoined to come up with $100 as his or her personal share of the expenses. I earned that money with a summer job at Brown Engineering. In addition, I worked door-to-door in Darwin Downs several times, trying to sell donuts, in competition with the Pierce brothers and Ronnie Hendrix, other neighborhood band members. In an attempt to increase attendance at our 1963 Spring Concert (and swell our coffers), the marching Generals took to the neighborhoods, hawking tickets. I remember strolling the streets of Lakewood with Linda Sewell, she in her gray majorette costume and me in my blue uniform, neither one of us eager to badger the homeowners. In another concerted effort, the band put down some tracks on vinyl. The album, a rare item now (but available as a CD on the website), is on the American Band Production label (Custom Division). The record jacket features blue-tinged portraits of the band and Mr. Foley. Artwork in blue and orange mimics the Confederate battle flag, and a blue football in the middle of the bars displays the news of our status as the chosen state representatives to the Orange Bowl. The word that we had officially been selected to participate in the Orange Bowl Festival must have come in the spring. Strangely, the booklet, which otherwise supplies an abundance of information, does not mention the specific date the news of our acceptance arrived. 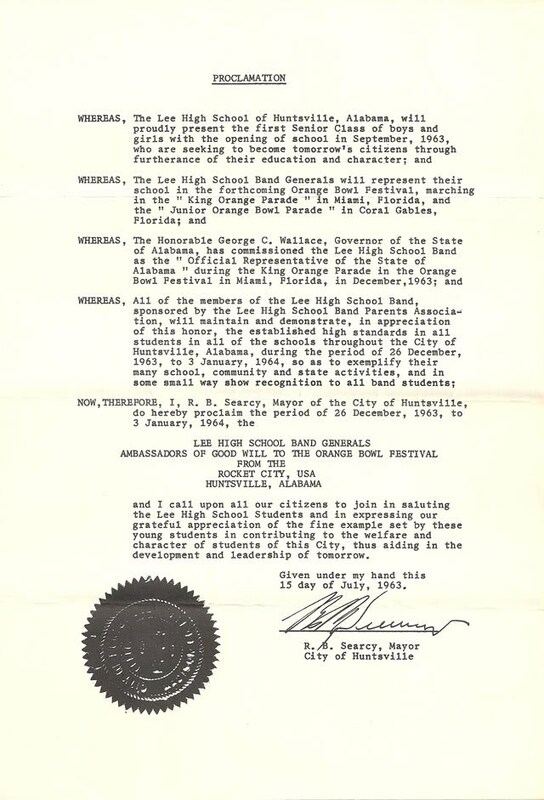 And sometime that fall Governor Wallace came to Lee High School himself, backing up his proclamation with a charismatic appearance. I can’t recall exactly what he said that day, but he must have told us what a great state Alabama was, and that we were the most important school in the state. Be proud and do us proud in Miami. And then he must have said something along the line of “And I’m so impressed with you that I’m going to give this great band even more money that I first said I would!” This seemingly spontaneous generosity fired us up even more. You better believe that we played “Dixie” with a fervor we’d never brought to it before when the “fightin’ little judge” left the stage that day. We all learned that demagoguery can be very contagious. Three days before our departure it snowed in North Alabama. On December 23, the Huntsville Times reported that “dreams of a white Christmas turned to nightmares this morning as snow strangled transportation throughout the Tennessee Valley and northward.” A hard freeze followed that night. Road conditions had improved by the time we reported to the school very early in the morning of the 26th, and it was decided we would proceed. We probably left close to the scheduled departure time of 2:15 AM. The first thing that happened after we boarded the buses was a mass seat-switching. As much as I liked most of my fellow band members, I wasn’t about to spend the whole trip to Miami and back getting to know Glenn James real well. (No offense, Glenn, after all these years.) Glenn was booted out of seat 17 and a certain fine-looking majorette slipped in next to me. A long caravan made its way across town. The three buses were accompanied by a truck and trailer hauling Traveller, our equine mascot; an Alabama Highway Patrol vehicle with two troopers; a truck carrying band instruments and other equipment; and four other vehicles for emergencies, communication gear, and to carry tour officials and their families. Collins Wynn’s father, Officer C.E. Wynn, traveled in bus 3 as the ground transportation marshal and police liaison officer. All was excitement and trepidation as we slowly crept up Monte Sano at the beginning of our adventure. When we came over the crest of the mountain and started the descent towards Owens Crossroads, the road conditions became treacherous. The truck and trailer conveying Traveller slid off the icy road, and I think all three suffered damage of some kind. The caravan halted. Our leaders conferred and decided that the journey would continue—with the band on foot. We were used to moving that way, of course, but not under these conditions. We left the comfort and warmth of the buses and walked along the shoulder of the cold mountain road, the vehicles descending cautiously before us and providing light. Because nothing bad happened to any of us, we can look back at this as sort of a lark in the dark, but it was dicey while it was happening. On reflection it was an experience perfectly designed for us to appreciate the attractions of our ultimate destination. In any case, it left us with a good story to share with our children or grandchildren. I wish I could remember how far we walked, but that particular information is gone. I’d be very happy if someone who has strong memories of this occasion would write in and provide more detail and drama. Anyway, we eventually got back into the buses. We still had several hours of darkness left. After all the excitement and exertion some people probably tried to sleep. Others talked quietly, reliving the experience and looking forward to the next day. We fade to black. Our first overnight stop was in Ocala, where we stayed at the Hotel Marion. We went to our rooms, put on our party clothes and came down to supper. Joining us for the meal, supposedly, were town officials, people associated with the Ocala High School band, and students from the school. If any of them were there, I don’t recall their presence. After the meal, we were bussed over to Silver Springs, where we danced until midnight to the sounds of the Top Hats. The next day (December 27) was going to be busy, so we were awakened very early. The schedule takes on a military tone for this one entry; it reads: “5:45 AM Reveille.” (I think we can be pretty sure that no band mother wrote that part of the schedule.) Sleepily, we dressed in our band uniforms, had breakfast, and then traveled 100 miles to Lakeland. There we marched in the Santa Claus Bowl Parade. The schedule called for an afternoon tour of Cypress Gardens. That evening we attended the Santa Claus Bowl, a “County Little League Football Game between County All-Stars and a team from Atlanta.” We were the guest stars for the half-time entertainment. Gloria Estefan didn’t show up. Right after the game, we saddled up and headed for Miami. We arrived at the Hotel McAllister at one in the morning. We had a little breather the next morning to explore the hotel and its surroundings. Situated on picturesque and glamorous Biscayne Blvd., the McAllister looked out on Biscayne Bay. The temperature was in the 70s, the palm fronds were blowing in the balmy breezes—you get the picture. We were truly a world away from cold and snowy North Alabama. In the afternoon of the 28th, we were transported to the swanky community of Coral Gables, where we marched in the Junior Orange Bowl Parade. We had the distinction of being the only out-of-state band to appear there. Sunday and Monday were days of rest and touring. The schedule shows us taking a Moonlight Cruise on Sunday night. Did we go? Somebody help me out here. I can’t remember. On the morning of the 31st we polished our marching skills at a local park and then spent the rest of the day waiting to take our place in the parade, set to start at 7. After the initial excitement of finally stepping out in the main event wore off, the parade became, in the later stages at least, a test of fitness. It was the longest parade we ever marched in. And because we didn’t know where we were, it seemed to go on forever. Somewhere along that lengthy route, the cameras of one of the networks caught us marching past and we made a brief appearance on national television. We were rewarded for our endurance with a New Year’s Dance at the McAllister’s Flagler Ballroom. Attendance at the Orange Bowl game between Auburn and Nebraska was the last big item of the tour package. We didn’t perform at the game, but we did show up in uniform. Our seating position beside one of the end zones would have made it possible for us to substitute for either one of the college bands had they been unable to perform. Auburn lost 13-7 when a late pass was knocked down by Nebraska. We left Miami on the 2nd. En route to our overnight stop in Jacksonville, we popped in at Cape Kennedy and toured some of the NASA facilities. The final homeward leg was done in one long stretch on January 3. Besides being a lot of fun for many people, the band’s trip to Miami was a significant part of the coming-of-age of Lee High School. In the year that our school grew a senior class and reached maturity, this was one of the projects where many people dreamed big and worked hard to accomplish a laudable goal. A final note: I’d be happy to supply copies of the booklet to anyone who’s interested in seeing the 1963-64 Orange Bowl Festival Project in more detail. Depending on the demand, I may have to ask for a small donation for postage and copying. If you don’t mind, would you please put a reminder about the upcoming Lee Lunch Bunch on the main page of your Traveller website? I am not sure all of the readers are thinking to look on the side menu for Upcoming Events. Thanks so much for your help, and also ask them to contact me if possible to let me have a fairly accurate headcount for the restaurant. Judy Fedrowich Kincaid cannot help me take reservations this time, so if everyone will just let me know, it will be most helpful. She was able to get a reminder out on Facebook though. Obviously many people ask for the garage/fireplace room at this particular Logan’s, and the manager always asks me for a certain number in order to reserve the entire room. We generally always fill that room up, so there is no problem with them trying to put another group in there with us. This week may prove to be a difficult time if the weather does not cooperate with these really cold and snowy days. Hopefully everyone will just watch the weather and not risk coming to town if the weather is too bad. We will see more of us for the spring LLB the last Thursday of April ( the 24th ). Thanks again. Would you mind updating the info on the 68 reunion? It will actually be the Classes of 68 and 69 reunion on May 16-17, 2014. Thanks .